The second AFL-NFL World Championship Game in professional American football, later to be known as Super Bowl II, was played on January 14, 1968 at the Orange Bowl in Miami, Florida. 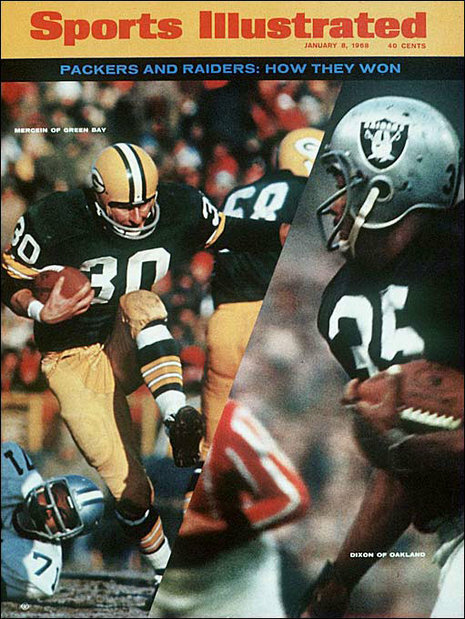 Aided by kicker Don Chandler's 4 field goals and defensive back Herb Adderly's 60-yard interception return for a touchdown, the National Football League (NFL) champion Green Bay Packers (9–4–1) defeated the American Football League (AFL) champion Oakland Raiders (13–1), 33–14. Green Bay quarterback Bart Starr was named the Super Bowl MVP for the second time for his 13 of 24 passing for 202 yards and one touchdown. In the first quarter, the Packers opened up the scoring with Don Chandler's 39-yard field goal after marching 34 yards on their first drive of the game. Meanwhile, the Raiders were forced to punt on their first two possessions. The Packers then started their second possession at their own 3-yard line, and in the opening minutes of the second quarter, they drove 84 yards to the Raiders 13-yard line. However, they once again had to settle for a Chandler field goal to take a 6–0 lead. Later in the period, the Packers had the ball on their own 38-yard line and they made a big play with a play action pass. Starr faked a handoff in the backfield and then threw a pass to receiver Boyd Dowler. The Raiders defensive backs were fooled by the fake handoff, allowing Dowler to slip by the man covering him, catch the pass, and outrun the defense to score on a 62-yard touchdown completion, increasing the lead to 13–0. After being completely dominated until this point, the Raiders offense finally struck back their next possession, advancing 79 yards in 9 plays, and scoring on a 23-yard touchdown pass from Daryle Lamonica to receiver Bill Miller. The score seemed to fire up the Raiders' defense, and they forced the Packers to punt on their next drive. Raiders returner Rodger Bird gave them great field position with a 12-yard return to Green Bay's 40-yard line, but Oakland could only gain 1 yard with their next 3 plays and came up empty when George Blanda's 47-yard field goal attempt fell short of the goal posts. Oakland's defense again forced Green Bay to punt after 3 plays on the ensuing drive, but this time after calling for a fair catch, Bird fumbled punter Donny Anderson's twisting, left footed kick, and Green Bay recovered the ball. After 2 incomplete passes, Starr threw a 12-yard completion to Anderson (who also played running back in addition to being the punter) to set up Chandler's third field goal as the half expired, giving the Packers a 16–7 lead. At halftime, Packers guard Jerry Kramer said to his teammates (referring to Lombardi), "Let's play the last 30 minutes for the old man." Any chance the Raiders might have had to make a comeback seemed to completely vanish in the second half. The Packers had the ball three times in the third quarter, and held it for all but two and a half minutes. On the Packers first drive of the second half, Starr completed a 35-yard pass to receiver Max McGee (McGee's only reception of the game, and the final one of his career), eventually setting up Anderson's 2-yard touchdown run, making the score 23–7. The Packers increased their lead to 26–7 on their next drive after Chandler kicked his fourth field goal. Early in the fourth quarter, Starr was knocked out of the game when he jammed the thumb on his throwing hand when sacked by Davidson. (Starr was replaced by Zeke Bratkowski, who would be sacked on his only pass attempt.) But later in the period, the Packers put the game completely out of reach after defensive back Herb Adderley intercepted a pass from Lamonica and returned it 60 yards for a touchdown, making the score 33–7. Oakland did manage to score on their next drive after the turnover with a second 23-yard touchdown pass from Lamonica to Miller, set up by Pete Banaszak's 41-yard reception on the previous play. But all the Raiders' second touchdown did was make the final score look remotely more respectable, 33–14. At the end of the game, coach Lombardi was carried off the field by his victorious Packers in one of the more memorable images of early Super Bowl history. Don Chandler ended his Packer career in style with 4 field goals. Oakland's Bill Miller was the top receiver of the game with 5 receptions for 84 yards and 2 touchdowns. Green Bay fullback Ben Wilson was the leading rusher of the game with 62 yards despite missing part of the second half while looking for a lost contact lens on the sidelines. Lamonica finished the game with 15 out of 34 pass completions for 208 yards, 2 touchdowns, and 1 interception. The Packers had no turnovers, and only one penalty.